I have reached a point where I actively look forward to programs from coreutils, because I know they’re going to be good. tee is no exception; like so much of what’s in coreutils, it is deceptively simple. 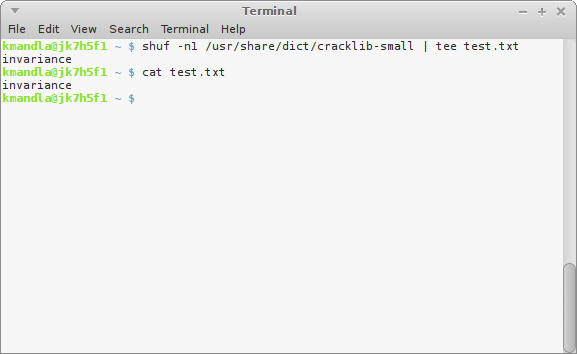 and gotten both the file I was after and the output to show, without relying on two commands (and arguably abusing cat). tee doesn’t just redirect to one file; you can list as many as you like. Knowing that there will be identical output means you can also use tee to write to a file, but wrangle the output in some fashion. This is where you should be thinking about sort or sed or whatever, to create a record of the output, then an adjusted version. This entry was posted in Linux and tagged edit, file, output, text on 2014/05/26 by K.Mandla. with a amazing use of tee utility. to put some output of a regular user command in a file (or append) that only root has permissions to write to.